If you ever went to one of those end of the year school assemblies, you might recognize the title from a certain song’s lyrics. I’m just partly wondering if they even do this song anymore, or if its too old for today’s generation. Yes, as of today, I’m not looking to create original content for 99EDHProblems.com. Really? Why are you shutting this blog down? If you’ve noticed that there has be little content on this blog recently. It’s not because I don’t love you guys. I just can’t create content for this blog as often as I’d wish. So, you’re not writing about Magic anymore? I’ve been writing for ManaNation about EDH/Commander. For those keeping track, I’m also writing for part time on QuietSpeculation.com and in discussion to write for another website for which I can’t talk about just yet. MTGColorPie is continuing as well (a new post should come in the next day or two for those that are wondering). As I’m planning out articles and topics, 99EDH was the one that always got shafted because of the overlap with ManaNation. Anything I would want to write for this site kept getting pushed back and put in the pile “I’ll get to it next week.” When people asked where I wrote, this blog was starting to get left out of my locations. Not because I didn’t love it, it was just getting too much to keep track of. I didn’t want to write about Commander for ManaNation and then do the same thing for this blog as well. I had been holding back in both places afraid to step on toes. And I’m afraid it was hurting my work. Now I won’t hold anything back for when I write for ManaNation. But the other thing good for you is that except for a break when I was on the Magic Cruise, I’m writing every week over there. You were lucky to get one every other week on here. That’s great for you, since you’re actually getting content on a regular basis, and great for me, since I won’t feel like I’m trying to spread things too thin. 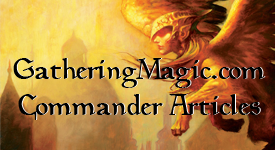 Because you’re getting my Commander thoughts there, this blog has really become redundant. But what about stuff like Stone Cold Commander of the Century (Of the Week)? I’ve got a ton of ideas. I don’t have the time nor the energy to do them all. I thought that I could do something fun and easy to keep this blog going. We know how well that went. So, I’m taking my talents to ManaNation where I might be talking about things like that every once in a while. SCCotC(OtW) seems like a nice thing I might tack onto the end of posts every once in a while, so it’s not going to disappear. I’ve paid for the domain name until later in the year. I’m not deleting this blog at all so if you keep coming back here you’ll find the same stuff. I was struck earlier this year about how UGMadness.net has now gone down and is gone for us forever. While I may or may not keep the domain name, I’m keeping the blog up for reference. Listen, I’m not saying that stopping this blog this is a bad thing. This blog has helped launch my work for ManaNation.com and Derfington’s at QuietSpeculation.com with both of us writing about Commander. You’re still getting Commander content, it’s just not going to be here. I hope you guys understand that, and respect that. It’s been great giving you my thoughts on this blog, I wish you’re with me for the next step at ManaNation.com where I’m continuing the adventure. This entry was posted on Monday, February 21st, 2011 at 7:37 pm	and posted in Commander, EDH. You can follow any responses to this entry through the RSS 2.0 feed. Sad to see this blog go. But i am keeping track of you on mananation. Good job in keeping this one going for so long. And Good riddance (Time of your life) is not beyond anyones generation, it was played at my graduation like 3 years ago. I respect this decision. I did notice not a lot had been posted in a while, but had also started reading ManaNation (at your bequest) so no big deal. Sometimes you just need to simplify your life and consolidate obligations to do your best work! I’m hoping that “other website” you can’t talk about yet is gatheringmagic.com. They really need a writer of your calibur right now. Also, Stone Cold Commander of the Century (of the Week) kind of turned into “Stone Cold Commander of the Century (of the Month)”, so I totally understand the need to trim down your commitments. Good luck to you in all your future endeavors!